“Plot Style tables are all well and good, and you get a big gold star if you’ve created your own. If you want something equally powerful, but a wee bit less technical, consider the Viewport Override columns in the Layer Properties Manager. On the Layout tab, activate the viewport in which you want to edit the layer colors. In the Layer Properties Manager, select the layers to re- ceive the viewport override for the color property. 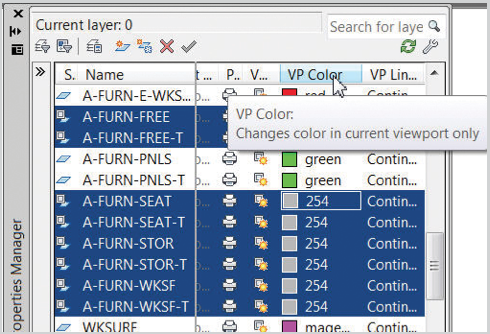 In the VP Color column, click the color swatch of one of the selected layers, then make your selection for the viewport override color for the selected layer(s) in that viewport. In addition to the VP Color column, you also have VP Line- type, VP Lineweight, and a couple others.